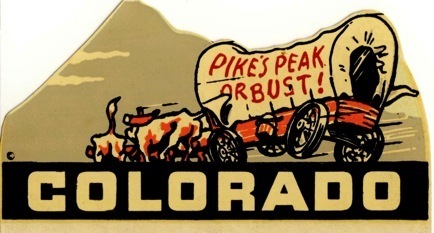 Gold seekers began moving Pikes Peakward on the Smoky Hill Trail in 1859. This trail was a wagon road blazed specifically for the Colorado gold rush. Used by gold seekers, stagecoaches, and freighters, it was the shortest route between the Missouri River and the new goldfields of Colorado’s Rocky Mountains. 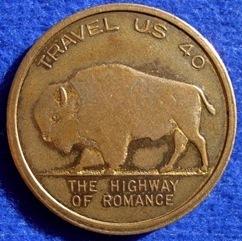 The route, which followed the Smoky Hill River across Kansas, then across the high plains of Eastern Colorado, would become the route of a railroad, early “auto trails,” U.S. Highway 40, and present-day Interstate 70. The Union Pacific Railway, Eastern Division, began construction west from Wyandotte, present-day Kansas City, Kansas, in September of 1863. The railroad would follow closely sections of the Smoky Hill Trail and would be followed almost exactly by U.S. Highway 40. Renamed the Kansas Pacific Railway in 1869, it was purchased by the Union Pacific Railroad in 1880. Passenger service would continue over the “Smoky Hill Route” until 1971. Named automobile highways from Kansas City to Denver in the 1910 and early 1920s included the Golden Belt Road, Union Pacific Highway, and the transcontinental Victory Highway. 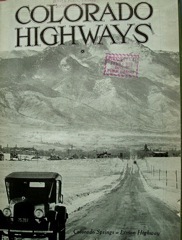 U.S. Highway 40 would be designated by the Federal Government in 1926. 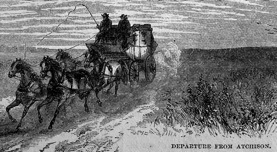 The Smoky Hill Trail was promoted by Missouri River towns of Leavenworth, Atchison, and Westport (Kansas City) as the shortest and quickest route to the newly discovered goldfields of what was in 1859 Western Kansas Territory. The route competed with the Santa Fe Trail / Cherokee Route to the south and the South Platte River Trail to the north. David Butterfield chose the Smoky Hill for his Butterfield’s Overland Despatch (BOD).